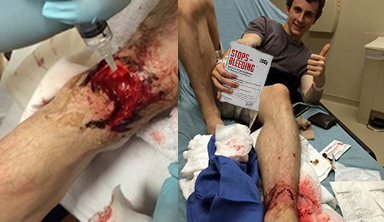 Available to consumers at affordable prices, StopsBleeding™ has revolutionized First Aid for bleeding injuries forever. There has never been anything like it before. Pour onto or pack into any bleeding wound generously. Apply pressure, and wait for the bleeding to stop. Proven to stop the bleeding in an otherwise lethal artery cut or laceration. An absolute must for patients on blood thinners. Works extraordinarily for people on blood thinners. Accidents are going to happen and, in today’s current environment, traumatic experiences can occur almost anywhere. Imagine if StopsBleeding™ were to be available to everyone at the next public, tragic event.